To join the Stonington Garden Club please open and print THIS MEMBERSHIP FORM. 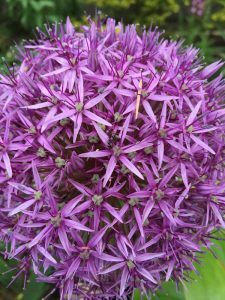 Stonington Garden Club members are encouraged to propose New Members. Please read this document to understand the process on HOW TO PROPOSE AN APPLICANT. It is highly suggested that you attend one-two meetings prior to application in the last 12 months. Please read this document that describes the process. Active participation in all Club projects. Of the 9 Membership Meetings, we have each year there are 5-6 of those meetings where there is either a speaker or workshop, organized by the Program Chair. Speakers are chosen to educate members about horticulture, the environment, conservation, flower shows & arranging, photography, garden history and design, legislation, or other relevant topics. Two to three members serve as Hostesses and provide refreshments; Members are encouraged to arrive early to mingle and enjoy the refreshments. Members are also encouraged to bring guests to meetings. You are kindly asked to introduce your guest at the beginning of the meeting. One or two Programs each year may be open to the public as a community service. The purpose of Conservation Committee is to inform our members (and the public where appropriate) about critical issues threatening our environmental health and to educate and inspire our members (and the public where appropriate) about conservation preservation actions which we can take collectively or individually to improve our environmental health. This committee is open to all SGC members (including New Members) who are interested in conserving our precious natural resources. Please join Conservation if you wish to be informed of important Conservation issues and/ or would like to actively participate in a project. 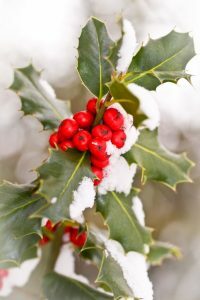 Last year the Conservation Committee has had a busy year with a focus on Community Outreach, educating our members through our monthly newsletter on water and energy saving tips, and providing visibility on key national and legislative conservation issues. The Committee is also responsible for communicating and tracking active club member votes on GCA’s Founder’s Fund. 1) The Conservation Committee sponsored a public forum on Climate Change. In 2018, SGC partnered with the Stonington Harbor Yacht Club to hold a public forum with the Town Planner and Town Engineer to review and discuss the results. 2)Inspired by a Conservation speaker, Judy Preston, an environmental consultant who developed the University of Connecticut’s coastal planting guides for Connecticut and Rhode Island, the SGC funded her consulting time to work with representatives working on the town’s new Mystic River Boathouse Park. 3) Annually a SGC club member travels to Washington D.C. to attend the Garden Club of America’s National Affairs and Legislation Conference . In 2018, a membership meeting was devoted to educating our club membership on key environmental issues and pending /proposed legislation to address these concerns. 4) The Conservation Committee takes field trips to view conservation films or visit local arboretums. Wayland’s Wharf, a public space located in the heart of Stonington Borough. Seeks to nurture the knowledge and love of gardening, to promote useful and valuable plants and to conserve those at risk. It supports the GCA in their efforts to educate their communities in responsible ways to plant, propagate, grow and show. Every year the Stonington Garden Club arranges a horticulture-related membership meeting with the Programs chair, the committee participates in activities in the community to educate its members. Horticulture supports and contributes to Conservation Committee and other garden committees. In addition, horticulture collaborates with Photography, Garden History & Design, and Floral Arranging to identify plants for various projects. The Garden History and Design (GH&D) Committee will establish short and long-term goals for our Stonington Garden Club GH&D program. To establish these goals, we will look at history and design education opportunities for our members and at documentation methods for recording public and/or private gardens found in our community. On-site visits, guest speakers and other events will be exciting ways for our club members to learn about historical and contemporary landscape and garden design. Our GH&D programming will also examine garden history within a larger social and cultural context. 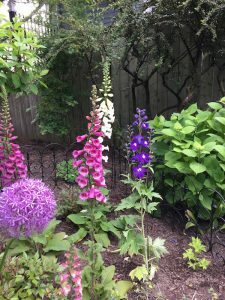 Documenting local public and/or private gardens, whether for reference use by our community or for submission to the Smithsonian Archives of American Gardens, is an important task of the GH&D Committee. How we think about public gardens, how we design and use our gardens, which plants we use and why, changes over time. Being able to capture and document what was or is, provides an essential record for understanding the social and cultural history of our times and as an inspiration for future gardeners. Publicizes the Garden Club of America’s domestic and international trips. These trips seek to educate members in garden history and design, horticulture, and the environment. In addition, when garden club members, from Garden Club of America associated clubs, inquire about visiting area gardens, this committee coordinates those visits with our members’ gardens. The Archives Committee is working its way through our many, many historical documents dating all the way back to the 1930’s. We are sorting through these documents with the goal of preserving them by having them scanned. The committee is also working to stimulate interest in the history of the club by writing short historical pieces for our newsletter. The Stonington Garden Club is full of talented floral designers that enthusiastically share their beauty and artistry. The club seeks to stimulate interest in the art of floral design and to educate its members at all levels of expertise and experience. Members often use their talents on behalf of organizations such as The Stonington Historical Society, New England Science and Sailing, (add more) other community partners in their local beautification and service initiatives. Club members participate in floral design competitions on the local, regional, national and international levels, serve as flower show judges and provide education in floral design. The Membership Committee works with the new members with their first-year obligations and helps existing members to navigate the several different committees and projects that members can become involved with. Members of this committee assist the Chair with the following duties: Keep and report attendance at the monthly meetings; assist with the distribution and collection of name tags; distribute new Yearbooks; provide potential members with information about our Club; discuss the meeting schedule, and furnish an application form. Committee members also reach out to the Active and Friend Members to learn about their committee and project interests for the year. Furthers the knowledge and love of gardening and the natural landscape through photography through the use of digital cameras (traditional cameras and phone cameras). It promotes the art, science and fun of photography at all skill levels through education. To build image and awareness of the Stonington Garden Club and to publicize its special events, workshops and community projects. Target audiences include media and consumers in Connecticut, Rhode Island and regionally. The recognition of members whose accomplishments and efforts further the SGC mission. The Awards Committee selects recipients from our membership to honor their outstanding achievements as they further the purpose of the Stonington Garden Club. Awards are given in the following areas: horticulture, conservation, historic preservation, environmental protection, flower arrangement, landscape design, literature, photography, merit in a particular area, leadership, appreciation, and communications. . We recognize our members annually, primarily at our Annual Meeting in June. We honor our members whose accomplishments further the SGC mission. The club donates books to the Stonington Free Library in honor of our members and friends who have passed. The design and updating of our club’s website. On the grounds of the Stonington Community Center’s is the Children’s Garden. Our club designs and maintains a variety of vegetable and flowers to support the educational programs of the COMO. A beautiful garden is designed and maintained by the Garden Club on the grounds of the Stonington Historical Society’s Lighthouse grounds. A small patch of land in front of the Stonington Borough Post Office is ours to design and cultivate throughout the year. This workshop, where club members make approximately 220 small holiday arrangements for local nursing home residents, serves as the Club’s December meeting and is held in the COMO auditorium, preceded by a short business meeting. Provisional/New Member members serve as Hostesses and direct the workshop with help from previous year’s Provisional/New Member members. Provisional/New Member Members gather greens from a variety of local gardens, bringing them to the COMO the day before. Arrangements are created and red and white carnations are purchased to decorate the arrangements, which are then delivered to nursing homes. An annual event, at the Stonington Community Center’s Village Fair, the club hosts a booth that sell floral arrangements, with proceeds supporting the Stonington Community Center. This event was started as a fundraiser, circa 2007, to benefit the Stonington Historical Society. It is a co-sponsored event with leadership from both SGC and SHS. Ideally co-chaired, but sometimes both reps are SGC and sometimes both are SHS. Merchants, organizations, garden clubs and others are solicited for decorated wreaths, which are displayed on the walls of the Palmer House. A preview party is held, usually the night before the Borough Christmas stroll. There is a Silent Auction for the wreaths and sometimes a speaker or children’s workshop over the weekend. 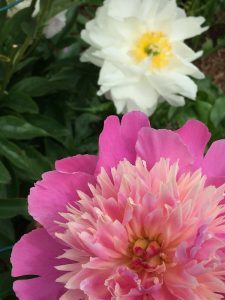 The Stonington Garden Club's objective is to educate and encourage interest in the environment, conservation, community projects and to stimulate the knowledge and love of gardening. Proud members of the Garden Club of America and the Federated Garden Clubs of Connecticut, Inc.